By definition, viral-associated GN indicates the direct pathogenic relationship between active viral replication and the development of acute GN. This definition is in sharp contrast to the semantic label and pathophysiologic foundation behind postinfectious GN that uniquely develops only during a period of resolved and absent active infection. The primary example of postinfectious GN are the glomerular lesions described after a pharyngeal or cutaneous streptococcal infection and do not represent the clinical or immunologic pattern seen with viral-associated GN. Hepatitis B (HBV) is the most common chronic viral infection in the world affecting >400 million people which is more than double the prevalence of chronic HIV and hepatitis C carriers combined. In addition, 10%–20% of HBV patients may be coinfected with hepatitis C and 5%–10% will have coinfection with HIV. Being able to distinguish the different types of GN seen with each viral infection is essential for the practicing clinician as each virus requires its own specific antiviral therapy. HBV-induced immune complex disease with renal injury lies on one end of the spectrum of disorders that occurs after a prolonged chronic carrier state. On the opposite end of the spectrum are renal diseases that develop from acute or subacute viral infections. One important glomerular lesion in this category is the association of collapsing FSGS with acute active cytomegalovirus, Epstein–Barr virus, and parvovirus B19 infection. The data supporting or disproving this relationship for each of these viruses will be discussed. A second renal manifestation of acute viral infections often occurs with many different sporadic or epidemic infections such as dengue and hantavirus and can lead to a transient proliferative GN that resolves upon viral clearance. The complex interplay of HBV and all viruses with the immune system provides conceptual lessons on the pathophysiology of immune complex GN that can be applied to all infection-related renal disease and plays an integral role in developing an approach to therapeutic intervention. This issue represents part 2 of the series on viral-associated GN. Part 1 covered the pathophysiology, histopathology, and clinical manifestations of the unique glomerular syndromes seen in those patients with actively replicating chronic hepatitis C (HCV) and HIV infection. In this issue, the focus is on both the glomerular manifestations seen in conjunction with a chronic hepatitis B (HBV) carrier state as well as the individual types of glomerular lesions seen with a variety of acute and subacute viral infections including cytomegalovirus (CMV), parvovirus, Epstein–Barr virus (EBV), hantavirus, and dengue. Many reviews have listed virus-associated GN syndromes as a subset of the category called postinfectious GN (PIGN) (1,2). This classification is not mechanistically accurate because PIGN is associated with the characteristic sequence of a latent time period from a completely resolved infection followed by an acute immune complex–mediated GN. This is in distinct contrast to viral-associated GN which occurs exclusively in the setting of an active replicating viral infection and resolves with eradication of the viremic state. In this scenario, there is no onset of renal disease that follows a latent period of absent or resolved infection. A new proposal for classification of the category, infection-related GN, centers on eliminating the term PIGN because the only proven infection that causes the clinical pattern of active infection – resolved infection – latent period– acute GN is streptococcal disease. Therefore, the term poststreptococcal GN (PSGN) should replace the use of the general term PIGN because no other infections fit into that category. All other infection-related glomerular diseases are considered separate and distinct from PSGN and the term “associated” is used to delineate the coexistent dependent relationship between active replicating infection and renal disease whether the infection is bacterial, fungal, protozoal, or viral (3,4). Virus-associated GN syndromes do not share a final common pathway of renal injury but do share the theme of an acute, subacute, or chronically active viral infection as the core foundation for their nephrotoxicity. By using this new classification on the basis of pathophysiology it is clear why antibiotic therapy is ineffective for PSGN and the key therapy for infection/viral-associated GN. A true global pandemic, chronic HBV antigenemia, defined as persistent circulating hepatitis B surface antigen (HBsAg), is present in 240 million people worldwide, representing 5%–6% of the world population. Approximately 2 million people in the United States are chronic HBV carriers with 20,000–40,000 new cases of HBV exposure occurring yearly (5). Overall, renal disease may occur in 3%–5% of patients with chronic HBV infection (6). The histologic manifestations of HBV-associated renal disease can be classified as those that occur as a result of either (1) immune-complex GN (membranous [membranoproliferative GN (MPGN)] and IgA nephropathy) or (2) immune complex–related vasculitis (polyarteritis nodosa [PAN]) (Figure 1). It is important to note that many patients with chronic HBV may also harbor coexistent HIV (5%–10%) and HCV (10%–30%) that may dictate the glomerular pathology expressed and further broaden the clinical differential diagnosis (7). Checking for these other latent viruses in all HBV carriers is essential during the evaluation process. Glomerular syndromes associated with an HBV carrier state. MC, mixed cryoglobulinemia; MN, membranous glomerulopathy; MPGN, membranoproliferative GN; PAN, polyarteritis nodosa. The histologic appearance of HBV membranous nephropathy (MN) is indistinguishable from idiopathic MN with clearly defined subepithelial immune complex deposits on electron microscopy. The antigen within the immune deposits in HBV-related MN may arise from three potential viral particles: HBsAg, HBcAg, or the HBeAg (8). In addition, from a mechanistic standpoint, the deposits may form from either deposition of an IgG immune complex with one or more of the stated antigens or with the de novo formation of an immune complex after deposition of the circulating antigen in the basement membrane first followed afterward by deposition of the circulating antibody. The size and charge of the antigens are an important determinant of their pathogenicity and ability to traverse across the glomerular basement membrane. The HBeAg is the smallest of the three antigens at 17 kD, with HBsAg measuring 35–50 kD and HBcAg at 22 kD. Approximately 90% of patients with chronic HBV and biopsy-proven MN have detectable HBeAg isolated from the glomerulus and >95% of these patients have measurable circulating HBeAg. 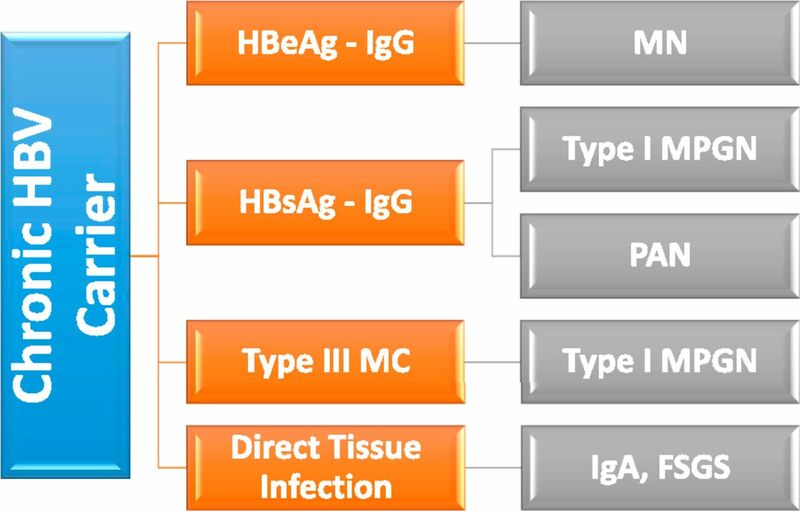 IgG-HBeAg complexes tend to be cationic enhancing their deposition in the subepithelial space compared with the anionic IgG-HBsAg complexes which are more restricted to the subendothelial space (9). In addition, acquired missense nucleotide mutations of the HBV x gene in specific locations (C1653T, A1726C, A1727T, C1730G, T1753C, A1762T, and G1764A) were found in 84% of patients with MN and in only 8% of control patients, which may explain the predisposition of certain HBV carriers to develop renal disease (10). Of the eight genotypes of HBV, genotype A appears to have the highest risk of MN or MPGN. It has been suggested that idiopathic MN can be differentiated from HBV-associated MN by the presence of circulating anti-phospholipase A2 receptor antibodies (anti-PLA2R) and by the characterization of the IgG subtype in the glomerular basement membrane as IgG4 (11). In HBV-associated MN the IgG subtype tends to be predominantly of the IgG1 class. Although initial reports showed <5% of patients with HBV-associated MN having a positive assay for anti-PLA2R (12), a recent study indicated contradictory findings with 64% of HBV patients showing anti-PLA2R (13). The study also demonstrated the presence of HBV antigens colocalizing with anti-PLA2R antibody confirming the possible association of these two findings. Therefore, the utility of anti-PLA2R in separating idiopathic MN from HBV-related MN is not clearly substantiated at the present time. Tubular reticular inclusions have been frequently reported in Systemic Lupus Erythematosis and HIV renal disease but have now also been described in MN associated with HBV and even in HCV glomerular lesions (14). The renal presence of tubular reticular inclusions then appears to confirm the local upregulation of IFN which any significant viral illness may stimulate and identifying their presence makes the diagnosis of MN less likely idiopathic in origin and more likely secondary to an autoimmune or infectious origin. Progression of HBV-related MN toward ESRD occurs in approximately 25%–35% of adults compared with a rate of <5% in children (15). Spontaneous biopsy-proven histologic resolution of MN has been shown in children which has been associated with systemic HBeAg clearance by the age of 4 years (16). MPGN represents the second most common renal glomerular syndrome in HBV carriers after MN in both adults and children and is characterized by the typical lobular appearance of the glomerulus with splitting of the basement membrane and mesangial, subendothelial, and even subepithelial deposits. The typical glomerular antigen deposited is the HBsAg due to its size restriction with IgG to the subendothelial space (17). Both type 1 and type 3 MPGN have been described in chronic HBV carriers. The clinical presentation is similar to patients with idiopathic MPGN and is characterized by the nephritic syndrome with or without nephrotic range proteinuria and decreased levels of serum C primarily in the classic pathway (low C3 and C4) (8). Recently reported as an additional cause of type 1 MPGN in HBV carriers is mixed cryoglobulinemia. The majority of these patients (75%) presented after >10 years of HBV infection with predominantly type 3 cryoglobulinemia (polyclonal IgM – polyclonal IgG). This compares to a greater propensity (80%) of type 2 cryoglobulinemia (monoclonal IgM – polyclonal IgG) with type 1 MPGN in chronic HCV infection of >10–15 years (18). HBV patients with cryoglobulinemia may present with nephrotic syndrome, AKI, and systemic vasculitis with low C4 (92%) and low C3 (58%). Because HBV is not lymphotropic, it is not known how HBV induces B cell cryoglobulin production. As a result of this new relationship of HBV and cryoglobulinemia it is essential to exclude coinfection with hepatitis C as a cause of MPGN in HBV carriers because up to 10% of patients worldwide carry both viral infections and the treatment will be dictated by which infection is causing the renal lesion. For HBV patients with MN, Kidney Disease Improving Global Outcomes recommends the use of IFN or oral antiviral agents which consist of either nucleotide (tenofovir, adefovir) or nucleoside (lamivudine, entecavir, telbivudine) reverse transcription inhibitors (19). In the treatment of hepatitis B MN, lamivudine (a cytidine analog) has been the most commonly used agent associated with an initial remission of viremia and complete resolution of the MN lesion in 75%–80% of patients. However, lamivudine is associated with a 20% per year resistance rate as a consequence of a somatic mutation of the HBV reverse transcription gene at the YMDD motif (Y, tyrosine; M, methionine; D, aspartic acid; D, aspartic acid) (20). For this reason, either entecavir or tenofovir have now been recommended as first line therapy as neither drug is associated with clinically relevant acquired resistance (21). A recent meta-analysis of 13 studies and 325 patients confirmed the clinical safety and renal efficacy of these agents in the treatment of HBV-associated MN. Corticosteroids may be given for a period of <6 months without a significant effect on liver disease, HBV viremia, or patient morbidity or mortality as long as concomitant antiviral therapy is used (22). The treatment of HBV-related MPGN with type 3 cryoglobulinemia is completely distinct from the treatment of HCV type 2 cryoglobulinemia and focuses on the control of HBV viremia rather than the use of direct-acting antivirals, rituximab, plasmapheresis, and possible cytotoxic therapy as systemic cryoglobulinemic vasculitis is unusual with HBV. Universal HBV vaccination has been shown to successfully reduce those childhood cases of HBV MN related to horizontal transmission of the virus but will have no effect of HBV MN due to vertical acquisition of HBV which still represents an important transmission vector in third world countries (23). The most common cause of PAN in the 1980s was HBV (>80%) however with global efforts of HBV vaccination, not only has the prevalence of HBV-associated MN in children declined dramatically but so have the number of cases of PAN from HBV (<20% of all cases). PAN in HBV patients is a result of HBsAg antibody immune complexes depositing in medium size blood vessels (24). Compared with idiopathic PAN, HBV patients had a more severe Birmingham Vasculitis Score on presentation, more frequent mesenteric artery aneurysms compared with renal artery involvement, a greater propensity for gastrointestinal vasculitis, less severe skin manifestations, and a more favorable response to therapy with fewer relapses. HBV-associated PAN leads to AKI from renal ischemia and infarction. Therefore, the presence of acute GN should exclude PAN from the differential diagnosis. HBV viral transcripts have also been noted in patients with IgA nephropathy and are located in renal mesangial cells of patients with FSGS suggesting HBV as a possible etiology of both of these lesions (25). In anecdotal cases, antiviral therapy led to resolution of the glomerular disease substantiating the possible causative role of HBV in a select group of IgA and FSGS patients. In addition, case reports of minimal change (MC) disease in children with HBV who entered into clinical remission strictly after antiviral therapy proposes yet another renal lesion with possible links to chronic HBV viremia (26). Although any acute viral illness can lead to an immune complex–proliferative GN, a select group of viral syndromes deserve special consideration for the way in which they induce glomerular injury: dengue, hantavirus, and the group of non-HIV viruses that have been associated with collapsing FSGS (cFSGS) (parvovirus, EBV, and cytomegalovirus). Dengue is truly a worldwide infection with 40% of the global population living in endemic areas especially Latin America, Southeast Asia, and the Pacific Islands. An estimated 100 million new infections occur each year through the bite primarily of the female mosquito Aedes aegyptii. Dengue is classified into specific syndromes: dengue fever, dengue hemorrhagic fever, and dengue shock syndrome. AKI is found in approximately 10%–14% of patients and is primarily seen in dengue hemorrhagic fever and dengue shock syndrome and results from acute tubular necrosis (ATN) as a consequence of hypovolemia (capillary leak) and/or rhabdomyolysis (27). GN in dengue is now well described in animal models and in human infection and results not only from immune complex deposition but also from direct viral entry into renal tissue (28). Predominant mesangial hypercellularity with immune complexes and IgM deposition has been reported with some patients showing diffuse proliferative GN. The presence of hematuria and proteinuria (both non-nephrotic and nephrotic) helps distinguish these cases from typical ATN. Treatment remains supportive in all categories of dengue but the sheer size of the population involved with dengue makes it certain that nephrologists need to be aware of the glomerular manifestations of this infection. Hantaviruses are RNA viruses that belong to the Bunyaviridae family and enter the population through exposure to rodent urine, saliva, or feces. Consequently, public health programs worldwide are challenged with the responsibility to eliminate the rodent vector from urban and rural population areas (29). Two major syndromes can develop from the 100,000 new cases of hantavirus exposure each year both of which may have associated renal involvement: hanta pulmonary syndrome and hemorrhagic fever with renal syndrome. Hantavirus has recently been implicated as one potential explanation for mesoamerican nephropathy (30). Hemorrhagic fever with renal syndrome is characterized by diffuse endothelial cell injury as a consequence of direct viral infection (via integrin αvβ3 and CD55) of most cells including renal tissue with resultant capillary leak and intravascular volume depletion leading to ATN. Capillary endothelial cells are similarly affected and podocyte effacement has been demonstrated leading to both nephrotic and nephritic syndromes (31). Complementing the podocyte injury is an extensive interstitial CD8+ T cell infiltrate with a “cytokine storm” that may contribute further to the degree of systemic hypotension and podocyte dysfunction (32). Mesangial proliferative GN with deposits of C3 and IgM and immune complex deposition have been reported. Similar to dengue, no specific therapy is available for hantavirus infection but preventive strategies with widespread vaccination are undergoing clinical trials. Viral-induced cFSGS has long been associated with parvovirus B19 (33). This relationship has been repeatedly emphasized in the differential diagnosis of cFSGS using in situ hybridization techniques; parvovirus DNA has been identified in renal endothelial and epithelial cells, both visceral and parietal, from patients with a variety of renal diseases including cFSGS (90%), idiopathic FSGS (80%), membranous (50%), and MC disease (50%) (34). Additional investigators have confirmed the ability to identify parvovirus within the podocyte and parietal cells of patients with cFSGS lesions to a greater extent than other renal diseases (35). Clearly, parvovirus proteins appear to remain in the kidney but whether they have any replicative properties that result in podocyte dysfunction is still a matter of significant debate. The final assessment is that in contrast to current accepted dogma the precise link between parvovirus and cFSGS is still circumstantial (36). CMV like parvovirus and EBV can cause acute immune complex GN especially with vertical transmission and MN has been the most common renal histology reported in this setting (37). In addition, CMV causes a distinct tubulointerstitial nephritis in transplant patients and may play a role in the development of transplant glomerulopathy. Acute CMV infection has also been associated with cFSGS. It has been suggested that the acute local renal IFN response could be responsible for the development of the FSGS lesion as opposed to a direct effect of the virus on the podocyte (38). Interestingly, the data supporting CMV as a cause of cFSGS appears stronger than that of parvovirus. EBV has been linked to the development of MN in both the acute and subacute setting and in rare circumstances cFSGS (39). EBV viral DNA however has been consistently localized to the renal tubules but rarely has glomerular deposition been demonstrated. Anecdotal cases of MPGN and postinfectious GN have been published but there are too few cases to draw consistent conclusions regarding the pathogenesis. The correlation of cFSGS is the weakest for EBV compared with CMV and parvovirus (40). Finally, the potential interaction of specific virus infections in a host with APOL1 variants and the long term risk of developing FSGS are being studied (41). At present, the unexpected association of the polyoma JC virus with the development of FSGS has been demonstrated. This data supports the importance of not just looking at the direct influence of a virus itself on podocyte regulation but also on host genetic susceptibility to FSGS that may be magnified by the viral infection. In children there is strong data supporting the role of many different types of viral diseases leading to a relapse of previously diagnosed MC disease. In particular, upper respiratory viral infections have been implicated such as respiratory syncitial virus, influenza, and parainfluenza (42). In addition, new onset varicella infection and the actual mumps/measles/rubella vaccine have been linked to a relapse of nephrotic syndrome from prior MC disease. It is hypothesized that cytokine release as a consequence of the acute viral syndrome may induce foot process effacement and nephrotic proteinuria. In contrast, a number of series have shown that acute measles infection has led to a temporary remission of MC disease (43). A variety of extrarenal autoimmune syndromes have also been reported to be attenuated temporarily and go into remission with acute measles, including immune thrombocytopenia and hyperimmune globulin E syndrome. An alteration of T suppressor/helper cells during active measles has been suggested as a cause of this downregulation of the immune system and transient remission of MC disease. No consistent effect of the mumps/measles/rubella vaccine has been reported on childhood nephrotic syndrome. In the evaluation of patients with GN, the presence of acute or chronic viral infections must be an important part of the differential diagnosis. Familiarity with the different renal syndromes associated with viral diseases is paramount which can then lead to specific diagnostic testing and therapeutic interventions that would not normally have been considered. The study of viral-associated GN has led to a better understanding of the complex interactions of the adaptive immune system, viral antigen–antibody immune complexes, genetic risk factors, and host cytokine responses that all lead to a unique array of renal pathology.